The report reveals the Deep State FBI opened an investigation on President Trump after he fired James Comey in March 2017. The investigation was launched based on unverified rumors. These political operatives leading the FBI should be tried for treason. Their job at the FBI is not to run a coup against the sitting president based on ridiculous rumors. They should be tried and hanged. What they did is no different than some coup d'état in a banana republic. It's time to shut down the FBI. President Trump responded early Saturday morning to a report published by the New York Times Friday night that the FBI opened an investigation into whether Trump was a Russian agent after he fired then FBI Director James Comey in May 2017. “Wow, just learned in the Failing New York Times that the corrupt former leaders of the FBI, almost all fired or forced to leave the agency for some very bad reasons, opened up an investigation on me, for no reason & with no proof, after I fired Lyin' James Comey, a total sleaze! “…Funny thing about James Comey. Everybody wanted him fired, Republican and Democrat alike. After the rigged & botched Crooked Hillary investigation, where she was interviewed on July 4th Weekend, not recorded or sworn in, and where she said she didn't know anything (a lie),…. “…..who is being totally protected by his best friend, Bob Mueller, & the 13 Angry Democrats – leaking machines who have NO interest in going after the Real Collusion (and much more) by Crooked Hillary Clinton, her Campaign, and the Democratic National Committee. Just Watch! Wow, just learned in the Failing New York Times that the corrupt former leaders of the FBI, almost all fired or forced to leave the agency for some very bad reasons, opened up an investigation on me, for no reason & with no proof, after I fired Lyin' James Comey, a total sleaze! …Funny thing about James Comey. Everybody wanted him fired, Republican and Democrat alike. After the rigged & botched Crooked Hillary investigation, where she was interviewed on July 4th Weekend, not recorded or sworn in, and where she said she didn't know anything (a lie),…. 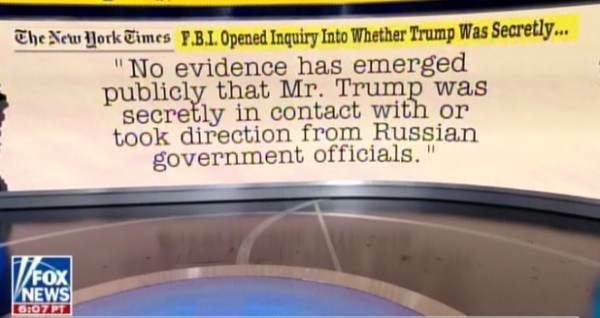 The post HIGH TREASON: NY Times Reveals Formation of Active FBI Coup Against President Trump Based on Outlandish Rumors appeared first on The Gateway Pundit.